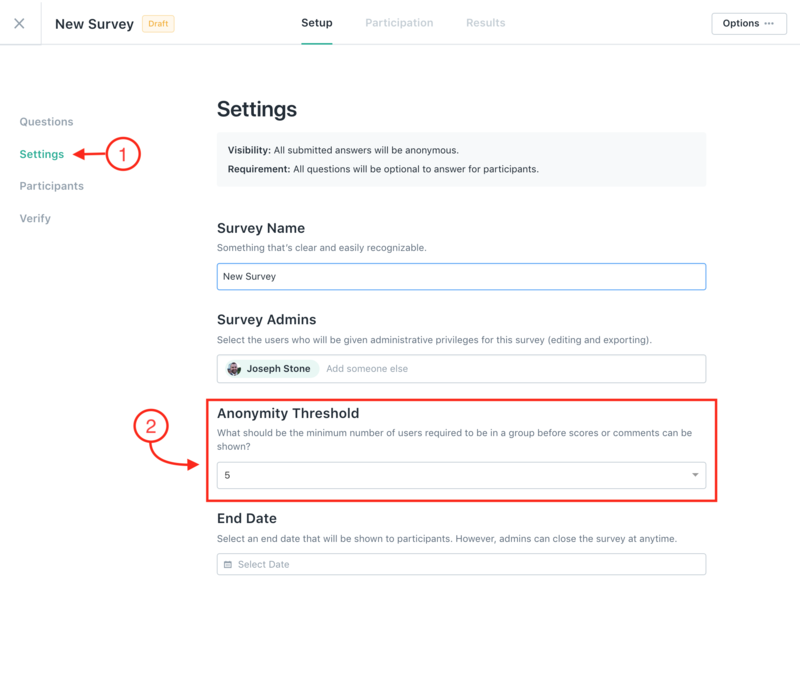 When setting up your survey, you will be able to adjust the anonymity threshold. This threshold sets the minimum number of responders there needs to be in order to view the scores for a question or theme. When adjusting this threshold, it is important to take the demographic make up of your organization and the privacy of the participants into account. While setting a lower anonymity threshold (i.e. 3 or 4) may help you view data for smaller groups, it may make participants feel vulnerable and keep them from answering the survey honestly. However, if you are trying to view a team that only has 3 members, having a lower threshold will allow you to more easily view their team data. Step 1: When creating the survey, click on "Settings" on the left. Step 2: Under "Anonymity Threshold" click on the drop-down arrow. Step 3: From the drop-down, choose the minimum number of users required in a group before scores/comments are shown. You can choose a minimum of 3 and a maximum of 10. Please note: After a survey has launched, you will not be able to change the anonymity threshold.